Our holiday ornament is as sweet as shortcake. Each whimsical glass ornament with traditional holiday accents starts as a hand-blown Polish glass ball upon which our Pennsylvania artisans, Judy and Lynn, bestow a unique personality by giving her just the right head full of fanciful trims. Each holiday ornament features festive details, faux gems and hair. 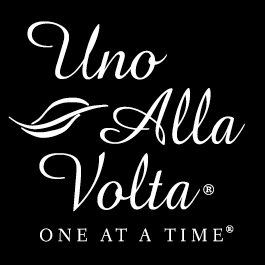 Each piece is masterfully handcrafted exclusively for Uno Alla Volta, from the hearts and hands of artisans. Reserve your 2016 Edition Whimsical Holiday Ornament risk free, you may cancel anytime. Click Here To See The 2014 Edition! Click Here To See The 2015 Edition! Judy and Lynn, our Pennsylvania artisans, are sisters whose talent appears to be genetic. "Our childhood was steeped in a very creative home environment, with two artistic and gifted parents, and very talented siblings. We would now be considered a very "green" household; most often our "fun" was utilizing found objects in arts and crafts projects, in seeing beauty and potential in everyday objects." The products Judy and Lynn design are handmade in the USA. Their wide variety of "everyday" ornaments celebrate holidays, seasons, and special occasions. Judy and Lynn have also perfected their 26-step process to create reverse decoupage gold leafed glass paperweights.